The video of massively popular boy band BTS's new song has surpassed 100 million views on YouTube at the fastest pace ever. 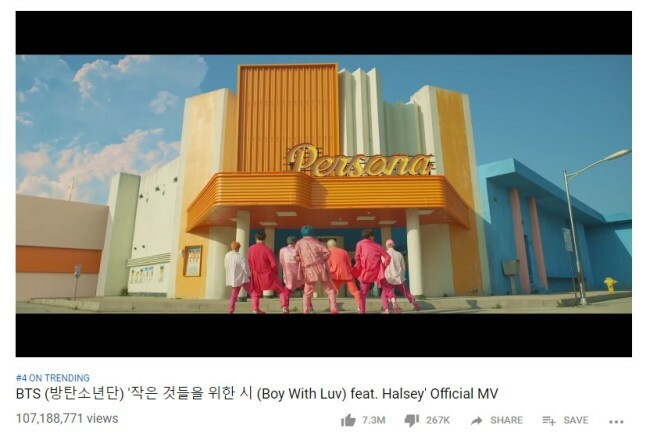 The music video for "Boy With Luv," the main track off the group's latest album, "Map of the Soul: Persona," released Friday at 6 p.m., topped 100 million views at about 7:37 a.m. Sunday, according to the band's management agency, Big Hit Entertainment. BTS achieved the milestone 37 hours and 37 minutes after the video was uploaded to the global video sharing service. The previous record was set by K-pop girl group BLACKPINK's "Kill This Love," which hit 100 million views 62 hours from its release on April 5.